Powers/Abilities: Lavinia's mutation gave her the appearance of a gargoyle, the perched, mythical creatures mostly seen as building adornments. She possesed hyper keen senses, enhanced strength, durability and agility, while her leathery wings allow for natural flight. With a recorded height of 3'8", she was officially a little person, though that only seems to increase her eagerness to fight and prove herself (see comments). (Quicksilver I#9 - BTS) - Gargouille (Lavinia LeBlanc) was recruited into the Acolytes by Exodus. She joined at around the same time as Projector (Zachary Williams) and Decay (Jacob Lashinksi). After some basic training, Exodus sent the three of them, along with longtime member Scanner, to the Savage Land where they were to aid Exodus' allies in obtaining Isotope E from the High Evolutionary (HE). (Quicksilver I#9) - Standing among hardened villains like Pyro, Avalanche, the Fenris twins, Omega Red and Random en route to the Savage Land, Gargouille stood ready to prove herself in battle against the Evolutionary, his Knights of Wundagore and their leader Quicksilver. However, while the others got to lay siege to the Evolutionary's citadel, Gargouille, Feral, Projector and Decay were ordered to stay behind and guard the Evolutionary's shuttle in case he should try and escape. When HE eventually showed up to beat a strategic retreat, Gargouille launched herself at him. However, the Evolutionary used the power of Isotope E to evolve a few simple insects into fearsome menaces he sent after her. During the battle, Decay lamented that he had to use his power to kill the insects, causing Gargouille to curse at him for feeling sorry for himself. Using the confusion, HE and his knights boarded the ship and took off. Dismayed at the poor performance of Exodus' allies, Scanner declared that from now on the hunt for the Isotope would be handled by Acolytes only. Gargouille and the others were teleported back to the Acolytes' headquarters on Mount Wundagore. (Quicksilver I#11) - As soon as the Acolytes picked up the Isotope E energy signature at the Haven, a castle owned by the HE in Upstate New York, Exodus told Gargouille and the others to leave immediately, obtain the Isotope and exterminate both HE and his Knights... including Quicksilver, the son of their god Magneto, should he refuse to cooperate. (Quicksilver I#11 - BTS) - In the dungeons of the Haven, Heroes for Hire members Ant-Man, Iron Fist and Power Man were continuing to evolve and devolve after an accidental exposure to Isotope E. While they struggled, the HE and his Knights had travelled back to Wundagore Mountain. (Quicksilver I#11) - Amelia Voght teleported Gargouille and the Acolytes into the dungeons of Haven, where they immediately encountered the devolved Heroes for Hire. Projector's force field held them at bay, while Gargouille correctly concluded they must be HE's creations. Not recognizing the heroes, Voght ordered the Acolytes to kill them, but their struggle was interrupted by Quicksilver who kept the Acolytes busy long enough for the Heroes for Hire to regain their normal appearance. Once Voght learned of the HE's whereabouts, she called for an emergency transport back to base. (Quicksilver I#11 - BTS) - As the Knights girded themselves for battle, while wondering why the Acolytes left so many of their weapon caches intact since taking over the Citadel of Science, Bova discovered there was a traitor in their midst: the Man-Beast had been posing as Lord Anon for months. Rushing to confront him, they were just in time to see Man-Beast stab HE and claim Isotope E for himself. (Heroes For Hire I#16) - The fight between the Man-Beast and the Knights of Wundagore was interrupted by Exodus and the Acolytes. After politely asking the Man-Beast to hand over the Isotope led to nothing, Exodus ordered his men to kill the Knights while he himself would take care of the evolved wolf creature. In the brutal conflict that followed, Gargouille was seen squaring off against Sir Ram. (Heroes For Hire I#16 - BTS) - The fight between the two teams ended when Exodus and the Man-Beast agreed to a truce. Man-Beast used his mental abilities to press the Knights into his service. Unbeknownst to them, the Heroes for Hire were making their way to Transia to help out. (Heroes For Hire I#16) - Joined by the Knights of Wundagore, Gargouille and her fellow Acolytes were sent to fight Quicksilver and the Heroes for Hire. Even though She-Hulk effortlessly beat off Gargouille, the team was ultimately beaten when they started devolving again. (Quicksilver I#12) - Using his superspeed, Quicksilver stole the Isotope E from the Man-Beast and freed the Heroes for Hire from the dungeons of Wundagore Mountain. Armed with the Isotope, the speedster and the heroes faced down the Acolytes. Gargouille was about to strike at Iron Fist when the Heroes for Hire once again started to devolve. 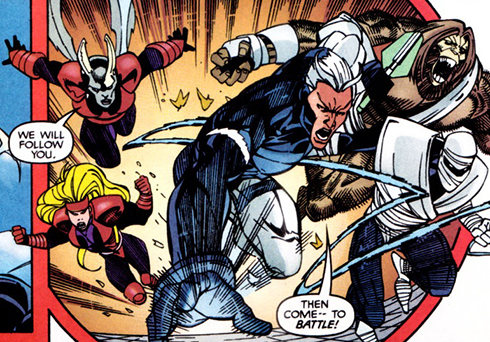 Forced to expose himself to the Isotope E, Quicksilver's powers grew exponentially until he was able to fight off the Acolytes and even managed to defeat their leader Exodus. Growing mad with power, Pietro demanded and got the Acolytes' loyalty. Just then, the HE announced his own godlike powers had been restored (at the cost of his sanity) and was ready to lead the world to the next phase of evolution. (Heroes for Hire/Quicksilver Annual 1998) - When the HE and the Isotope E enhanced Quicksilver squared off, Pietro ordered the Acolytes to aid him. However, the bulk of the team decided they no longer had a stake in the conflict and refused to fight other people's battles any longer. But as soon as Exodus sided with Quicksilver in opposing the HE, a few Acolytes including Gargouille joined him. The others decided to leave, except for Amelia Voght who elected to stay behind to watch how the battle would unfold. Gargouille joined the Heroes for Hire in attacking HE, who trapped all of them in animated roots and was about to claim victory until an impromptu uni-mind created by Thena, Exodus and the Man-Beast proved effective in beating him back. (Heroes for Hire/Quicksilver Annual 1998 - BTS) - After the hostitilities between Quicksilver, the High Evolutionary, the Knights of Wundagore and Heroes for Hire had ceased, Voght quietly teleported Gargouille and the other Acolytes away. (New X-Men I#116 - BTS) - Gargouille was on Genosha when Cassandra Nova's Sentinels laid waste to the island. She survived the massacre however. (Uncanny X-Men I#492 - BTS) - Following an undocumented falling out with Exodus (Bennett du Paris), Gargouille and several of her fellow Acolytes left the fold and struck out on their own. (Uncanny X-Men I#492 - BTS) - When Mr. Sinister and his Marauders, among them new member Exodus, kidnapped the first mutant baby born since M-Day, the X-Men decided their best bet to getting a lead on Sinister was by chasing down the other former followers of Magneto. (Uncanny X-Men I#492) - Angel spotted Gargouille leaving the safe house, trying to rake him with her claws as she attempted to make her mistake. While Colossus and Wolverine took care of her teammates inside the house, Gargouille hung around long enough to be surprised by Nightcrawler teleporting in overhead and knocking her out. (X-Men Legacy I#225 - BTS) - Gargouille was seen in the image Exodus generated of the Acolytes, when he tried to convince Charles Xavier his crusade on behalf of mutantkind was just. (Uncanny X-Men I#518 - BTS) - Somehow escaping imprisonment and leaving the other former Acolytes behind, Gargouille wound up a beggar on the streets of New York, living in the sewers with her unidentified boyfriend. (Uncanny X-Men I#518) - After a particularly unprofitable day of begging, she returned "home". Expecting to find her lover she instead encountered a stray Predator X. The beast quickly jumped and killed her. (Uncanny X-Men I#519 - BTS) - When Gargouille's mostly devoured remains were discovered by her lover, he sought out the aid of Fantomex. After hearing what happened to Lavinia, he linked her case to a string of other mutant deaths, all hunted and murdered by the Predator for their nourishing X-gene positive bone marrow. Comments: Created by John Ostrander & Joe Edkin (writer), Ivan Reis (pencils), Randy Emberlin (inks). Considering Gargouille and the other Acolytes moved to Genosha with Magneto in the late 90s and stayed there for at least a little while after the Cassandra Nova incident, one could reason she was there for the Eve of Destruction event, not to mention the two Magneto limited series. 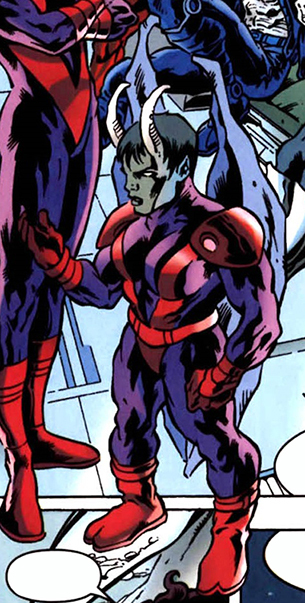 In her earliest appearances, Gargouille is exclusively depicted as pint sized, however in the most recent X-Men issues she is seen at a relatively normal height. Whether or not she can change her size or if her strength and other abilities increase as she becomes smaller has never been revealed. At normal height, she could still fly, but her enhanced senses, strength or durability weren't enough to escape death at the hands of Predator X. "Gargouille" means "throat" in French. The few times she spoke, Gargouille used French words which given that her name is Lavinia LeBlanc isn't too surprising. It's not been revealed if she's French or perhaps French Canadian or even Algerian. Gargouille, along with the other Acolytes, received profiles in Official Handbook Of The Marvel Universe A-Z#1 and Marvel Encyclopedia: X-Men.